I have always loved bacon. 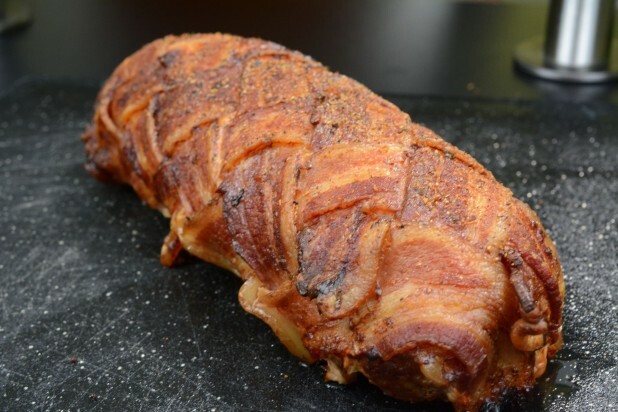 It is definitely my favorite type of meat and the ultimate in bacon cooking is the Bacon Explosion. If your not familiar, the Bacon Explosion is basically a meatloaf wrapped in bacon. There are lots of different variations and today I would like to share mine with you. I cooked this for dinner during the Superbowl. 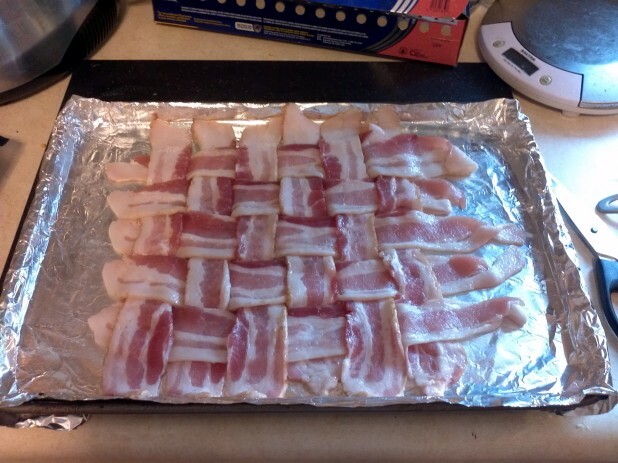 The first step is to foil line a pan and make the internal bacon weave. This weave will be a 5×6. 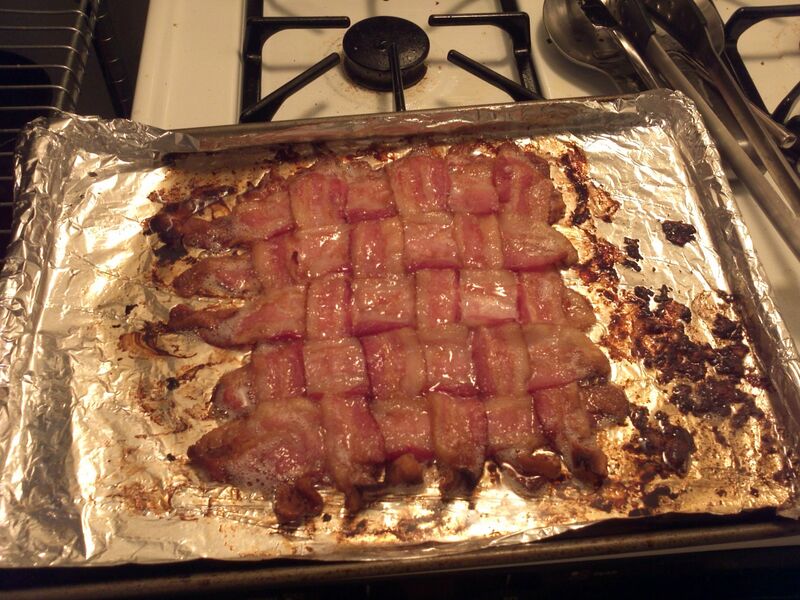 Line up five slices, then start weaving bacon in until you get a five by 6. Bake this weave in the oven @ 400 degrees until mostly done. 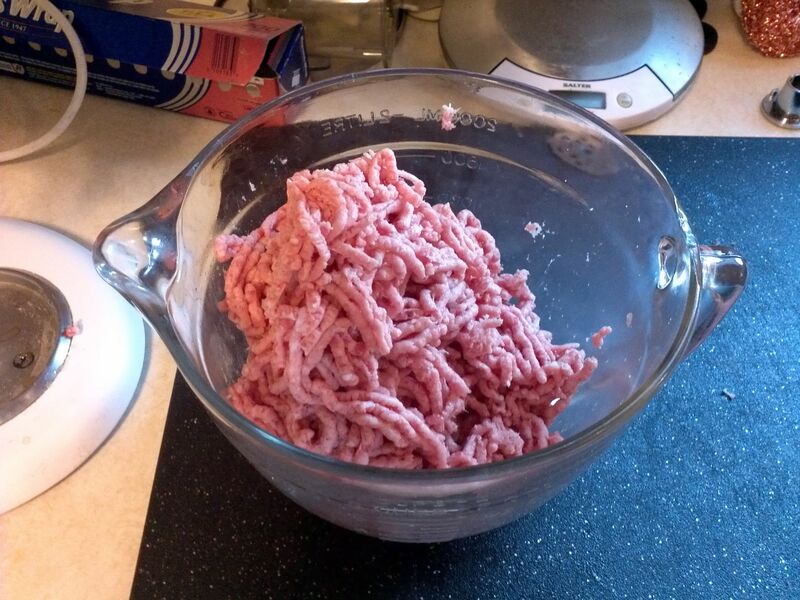 The next step is to make the meat! You could also buy the meat but I enjoy grinding. 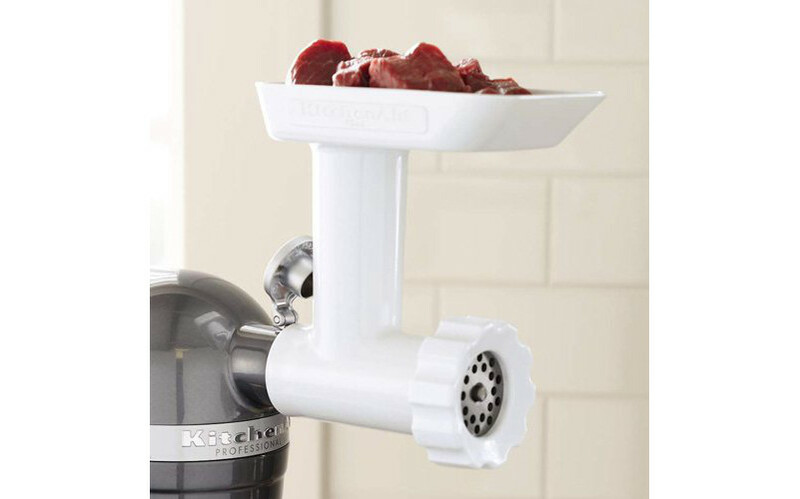 This is just the food grinder attachment to the Kitchen Aid mixer. 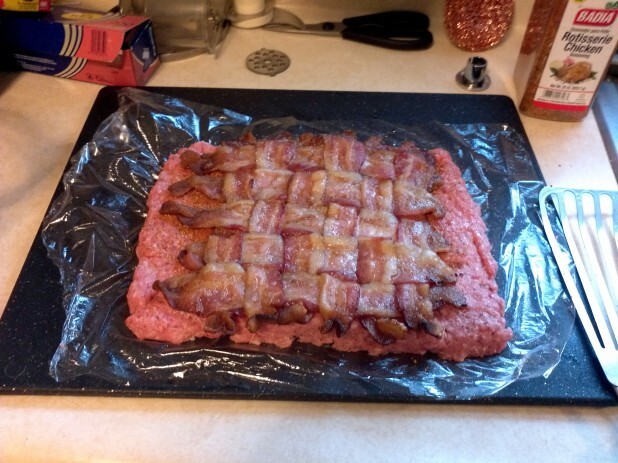 I used Round Eye steak, Jimmy Dean’s Sausage and 4 pieces of bacon. I used the fine grinding attachment and ground the meat twice. 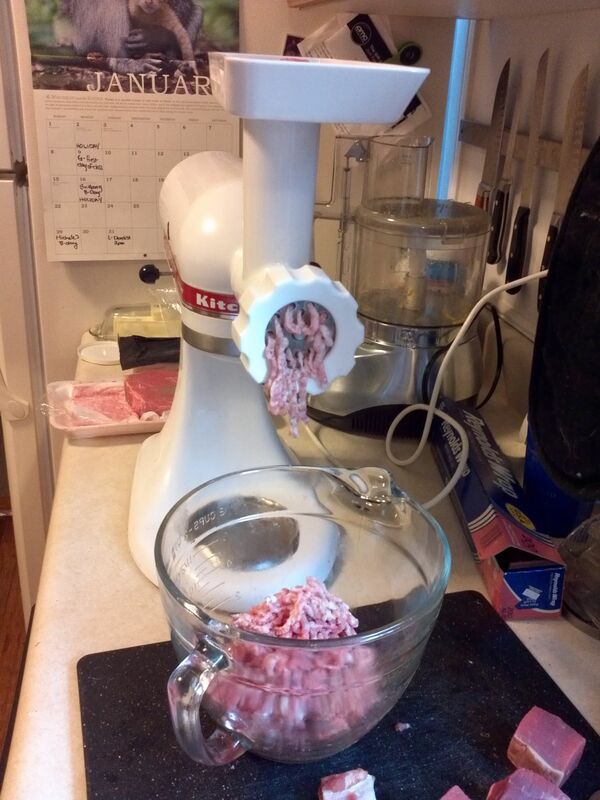 You put it through the first time and then mix it by hand, then run it through again. 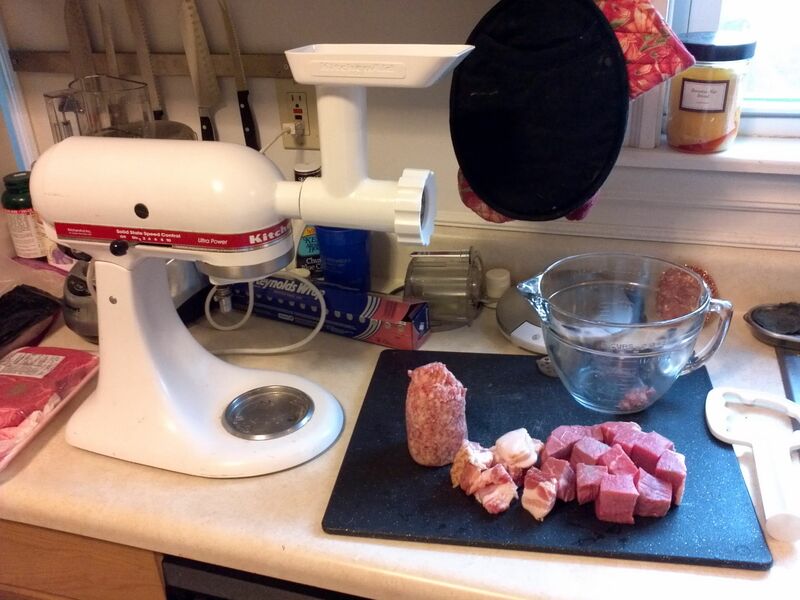 Don’t bother cutting the fat off the meat, it gets incorporated by the grinder. Here is a picture of the final product! The next step is to lay some saran wrap on a board and using your hands form a rectangle. 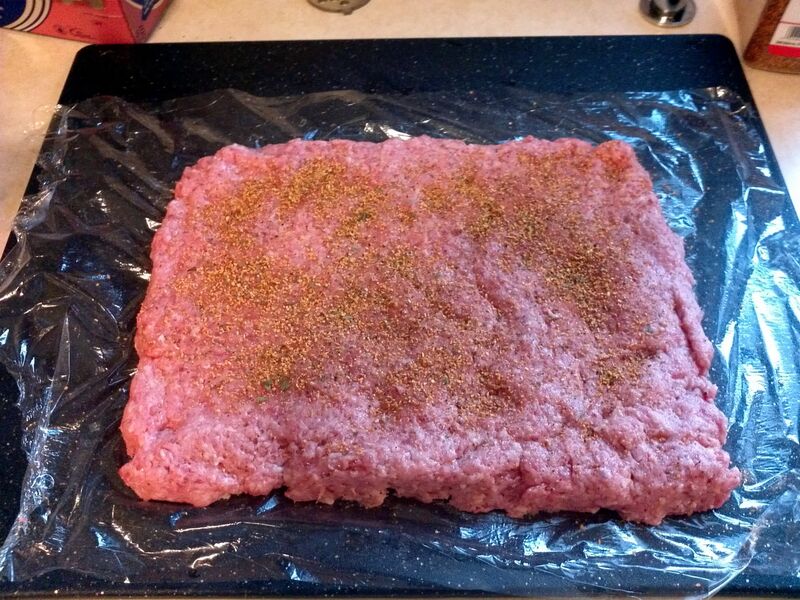 I added some seasoning to the meat. At this point your 5×6 weave should be ready. You don’t want it to be completely hard because this one needs to be flexible. Carefully move the bacon on top of the meat. 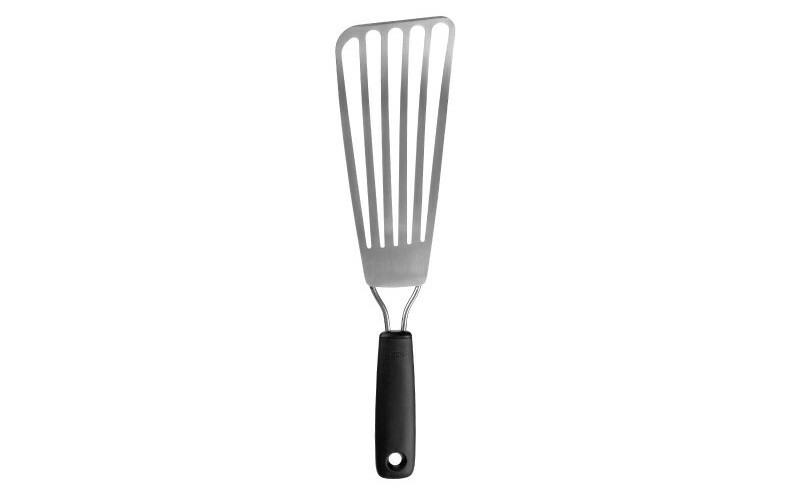 I used what is called a fish spatula but anything will work. At this point you can put anything into the middle. I fresh ground some cheddar and threw it in there! 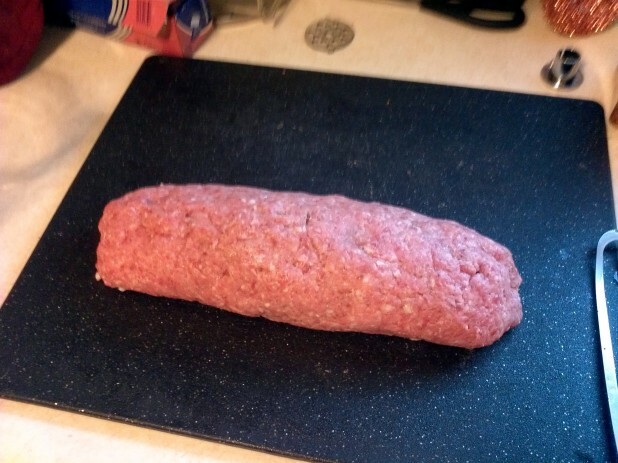 At this point, you need to roll the meat up. Try and have as clean a roll as possible. Merge the ends together so that it is one consistent entity. At this point, it is easier to work with if it is a little cold. 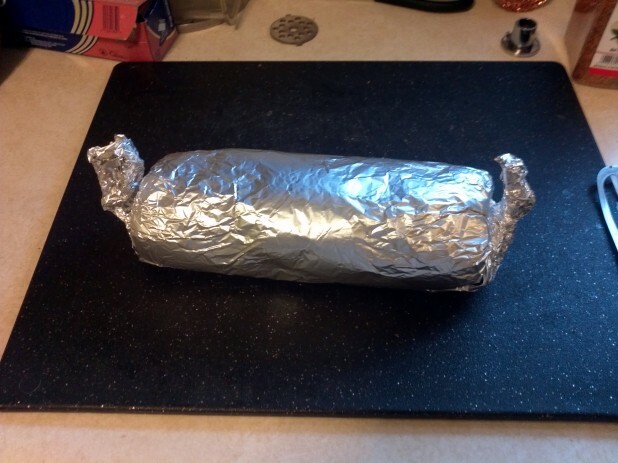 So, I wrapped it in foil and put it in the refrigerator. Also, during the process I tried to compress it as much as possible with the foil. Now we get into the main show. You should have gained some experience weaving on the first one. This one is important and make sure it is tight. Also, make sure you buy really consistent bacon. I actually look through a couple of packages at the store. If it is cut or larger on one side, it makes wrapping hard and inconsistent. I also seasoned this part. 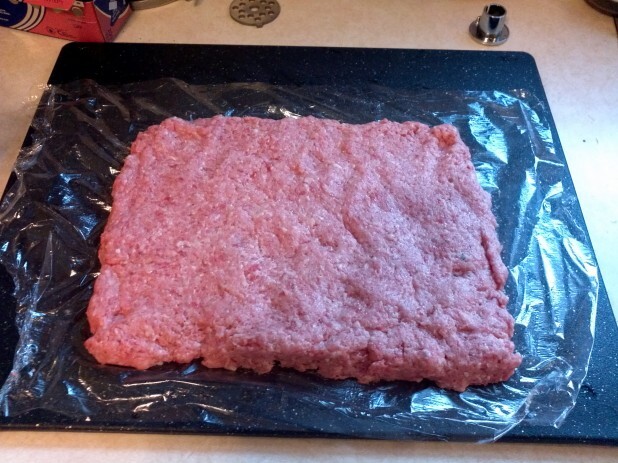 Now, take the meat out of the refrigerator and place it approximately as shown. Then wrap the weave over top and tuck it in on the other side. A lot of the other wraps shown on the internet wrap horizontally. This is not nearly as cool, wrapping on a diagonal makes a much nicer final product. It also works better when you cut it. Here is what it looks like before the oven, beautiful isn’t it!! I used the same pan as before for the first weave hence why it is dirty. I put it on a rack so the bottom cooks as well. And there you have it! I baked it for around 60 minutes on 400 degrees. But I mainly checked it until the internal temperature reached 165 degrees.Here is the beautiful inside. 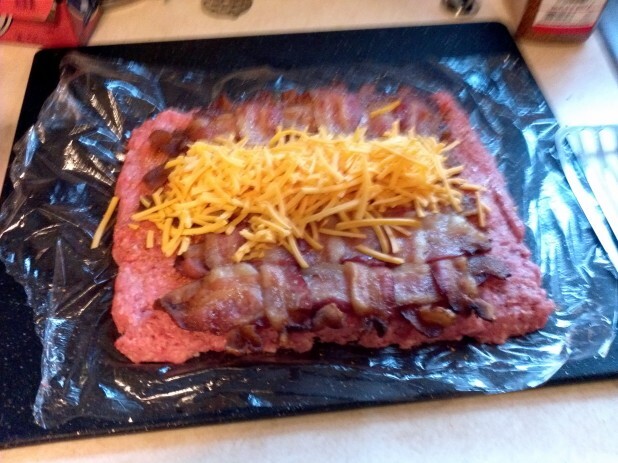 You can see the cheese, bacon, then meat then bacon! Here’s the Bacon Explosion out of the oven, man did it turn out well! I really like the diagonal wrapping, I think it gives it a solid look and better coverage than a straight 90 degree wrap. Mmmmm! 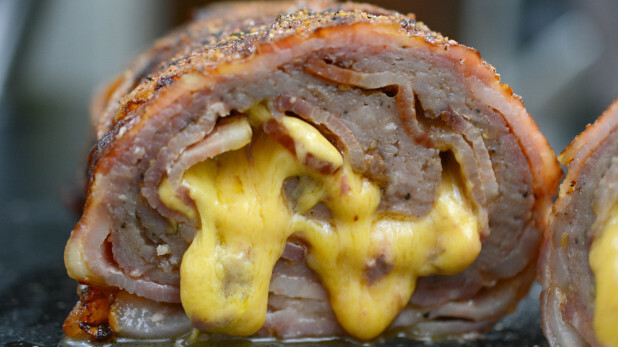 Bacon Explosion - Bacon wrapped meat stuffed with bacon and cheese. Let set for 10 minutes and then slice and enjoy! ah i remeber seeing this somewhere before and thinking I have to try it! now I really do as it looks great! Thx for the advice, and the web-site definitely looks awesome. Just what word press theme are you utilizing? Its the standard worpress twenty eleven theme with some tweaks so it shows excerpts on the front page. I also tried to compress the top part and of course almost everything in wordpress is configurable without coding. 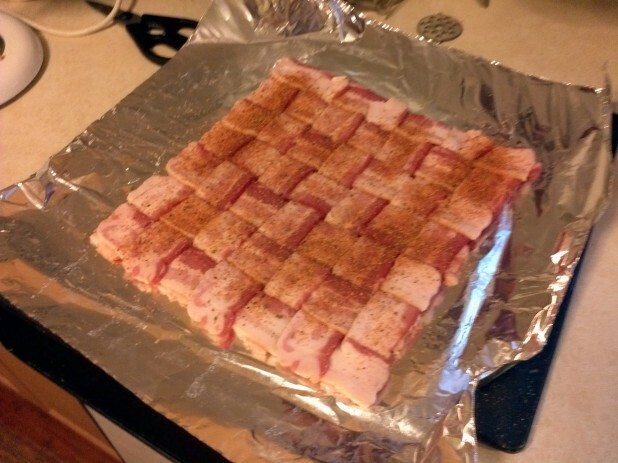 Just wondering what spices you added to your bacon! 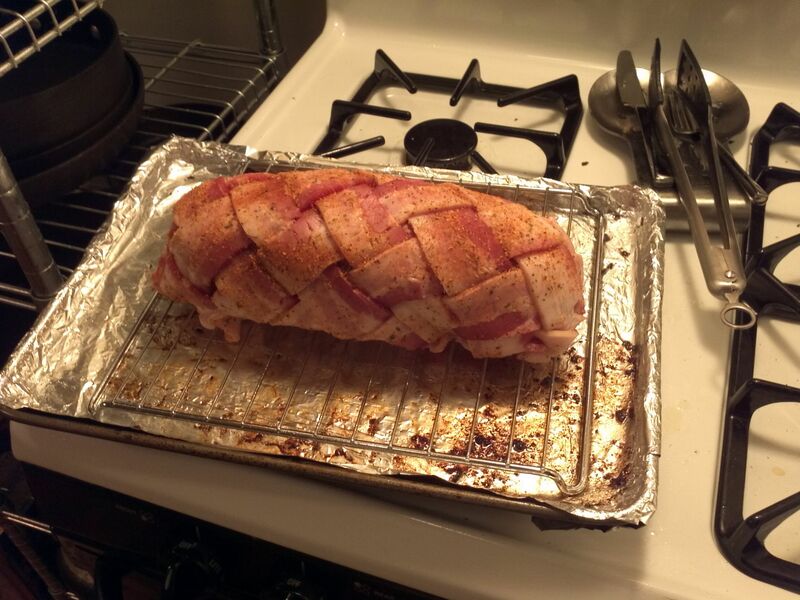 I don’t know if it was the ideal fit, but I used a chicken rotisserie multi-spice. 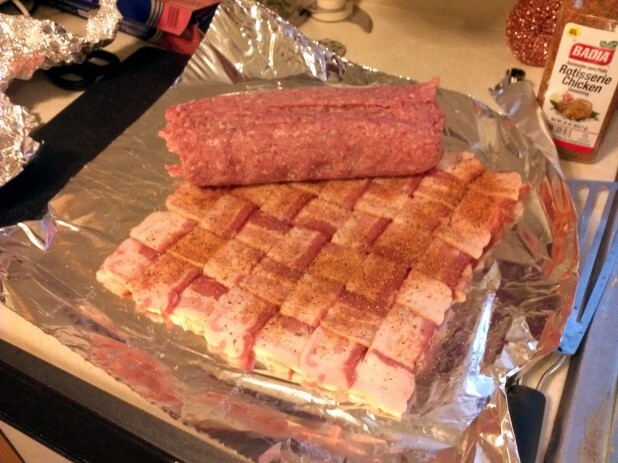 Good luck on your bacon explosion! 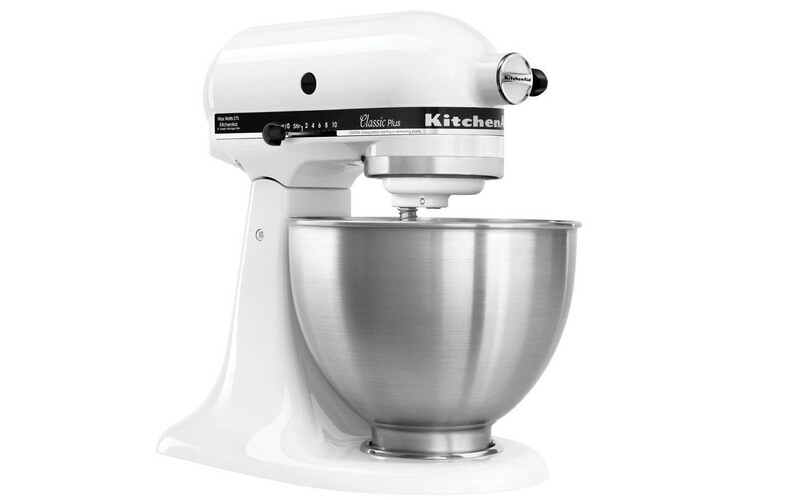 Which kitchen aid mixer do you have? I have made this a few times now – big hit with non keto friends and an awesome way to have lunches for the whole week – and I just made one stuffed with extra cheese and some diced spinach, broccoli, garlic and mushrooms to get those vegetables in. 4 oz cheese seems like a very small amount so I just put in a handful! Can i just add extra pork instead of adding steak? I’m sure extra pork would be fine, or ground turkey, although turkey wouldn’t have quite as much fat content if you’re doing Keto. This is every bit as delicious as it looks! For those of you asking what spices to add to the meat, I just sprinkled the usual… Salt, pepper, and garlic and onion powders. 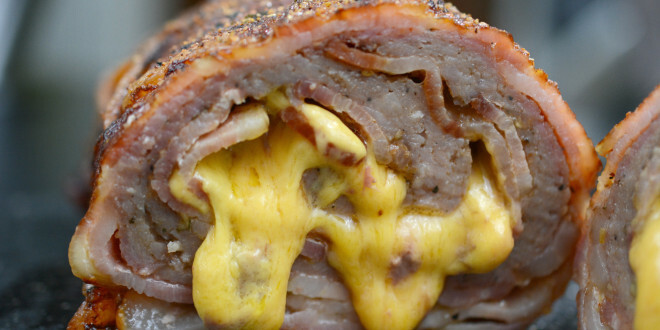 Calling this “Meatloaf” would be like calling a Lamborghini “a car”, it’s WAY too amazing!!! Just made this tonight. 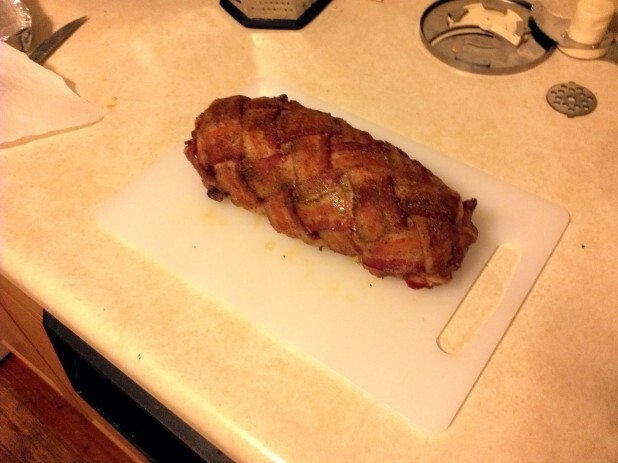 I used Montreal spice bacon for the inner weave and ghost pepper bacon for the outer weave. I like my food spicey! Turned out awesome and taste amazing!